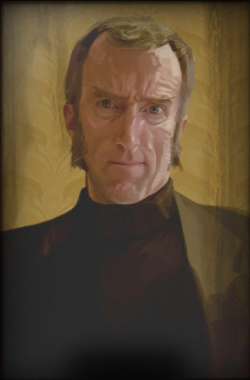 Cave Johnson is the founder of Aperture Science, which evolved from its precursor, Aperture Fixtures and later Aperture Science Innovators. 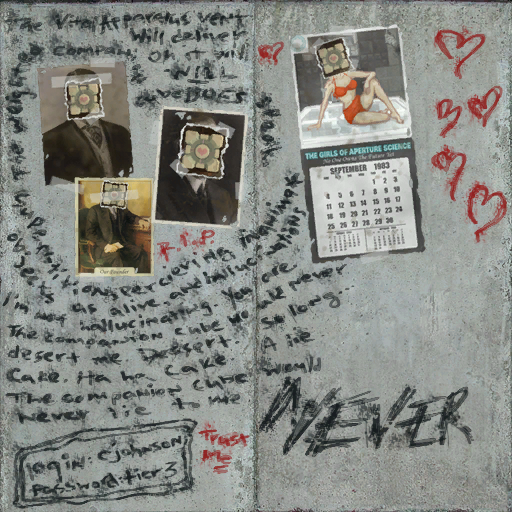 Cave Johnson first appeared by a username and password scrawled in one of the Rattmann's dens during Portal, and was fleshed out and provided with additional details during the Portal ARG. In 1943, Cave Johnson created Aperture Fixtures, a shower curtain manufacturer. The precursor to Aperture Science, he selected the name because it 'makes the curtains sound more hygienic'. He became a billionaire after winning contracts to manufacture shower curtains for all branches of the U.S. Military except the Navy, winning the '1943 show curtain salesman of the year' award. Based on his portraits and the dates of them, it is generally assumed Cave Johnson was born somewhere between the late 1910s and the early 1920s. He was also planned to be some sort of Storage Cube, which can be seen within some unused subtitles, where GLaDOS and he met and discussed Caroline before he was unplugged. Cave Johnson started the GLaDOS project as a way to cheat death before he died from his moon rock poisoning. If he were to die, he said that he wanted Caroline to be inputted into GLaDOS. This page was last modified on 1 April 2019, at 12:39.